If Sarath Fonseka has the right to speak to media as a prisoner, then all other prisoners have the right to do the same as well, Minister Mervyn Silva said today (06). He challenged the government to stop the former Army Chief from speaking to media in this manner, and if unable to do so he proposed that he be empowered as he would put a stop to it. He pointed out that if Sarath Fonseka is to be released only President Mahinda Rajapakse can consider it and implement it. You are quite right in this instance.Where else in this world do you get prisoners allowed to address media as in sarath fonseka’s.Surely there must be laws or regulatory procedure to arrest this kind brazon audacity. Authrities seem to be blind. But good doctor,please do not ever take the law into your hands.You escaped once with a severe warning.You have highlighted the lapse.That’s enough. Hellow silva ur very bad minister in sri lanka government if its fonseka was are good leader of the war and SL Army why are u saing this very bad. SF got away with a light sentence for treachery. In USA he would have been sentenced to life imprisonment at least, if not death sentence. He still needs to be tried for conspiracy with others for a coup d’tat on losing the Presidential election. He should never be even considered for a Presidential pardon let alone special privileges, such as access to the media. He is already conspiring with others, to topple MR govt on being granted Presidential pardon, hopefully. He is hoping to bring SL under US and imperial West ambit, and to grant ‘eelam’ to TNA. A traitor will remain a traitor for personal gain, just as a leopard cannot change its spots. Mervin mahataya kiyanna ake harri.We all should respect the law and justice,if SF get media attenstion and give interview so other prisoner also have same rights! Sarath fonseka is a traitor must send life sentence! Ps:note i am not any politics supporters or belonging any party. If sarath fonseka get special facilities, the other prisoners also have same rights. The Presidential mouthpiece is wagging. Similar to to the Tamil diaspora, the “Release Fonseka” movement has been consistent in their efforts which have now reached the doorstep of the White House. Those who crow “anti-imperialism” should note the President’s speech at the UN recently was drafted by an “imperialist” consulting company and preference to that script was giver over the script produced by the wobbly External Affirs Minister, Hon GLP. SF is a political prisoner similar to Aung San Soo-Chi. He will lead this nation towards, if not anything else, discipline. How he gets to the big seat is of course, dependant on the SL citizens. The Blue Brothers appear to be shaken recently; they appear to be under lots of anxiety and their careless reactions betray loss of confidence. All good things, including stolen wealth and vainglory, does come to an end. The democratic alternative leadership to SL lies with Dr Buddhika Pathirana. If the UNP fails to identify Dr BP’s potential and elevate him to his role, Buddhika should breakway and independently focus on the Presidential seat straightaway. 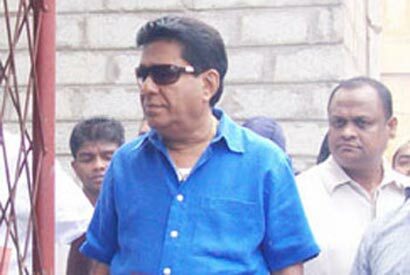 As said somewhere else in OnLanka, Buddhika is the Obama of Sri Lanka. He has the capability to inspire a nation. You pose a very simple question. You want to know if sarath fonseka is good for war why he is not fit to lead the country?There are so many factors why sf should not be selected as a leader , a good number of reasons are cited by ND in entry no.3. As for your querry, let me quote the instance where Sir Winston Churchill-the man who spearheaded the World War 2 to Victory over the might of the Nazis and Japanese was unceremoniously bundled out of office at the very next General elections .Atlee was retuned to Power and we were lucky to get our independence . Whether sf did his best towards the final victory over LTTE is highly debatable. Hey guys all patriotic srilankans agree that SF should not be given special treatment. But I think someone like Mirvin should keep his mout shut because he belongs behind bars for all the stupid things he has done while in parliment. Sri lankan politics is become a joke with jokers like mervin and kudu. So it’s best that mirvin stick to his crooked activities. Prisoners cannot talk to the media is well taken. But those people who theft are not in prisons. What about them? I suppose Ishan and FM and a few other bloggers, who commented in favour of SF, voted for SF at the last Presidential election. However, SF got less votes than even RW, at the previous Presidential election. Commander-in-Chief and his bro, the Defence Sec, planned and executed the final war against the LTTE and defeated them totally. SF was to retire, but his service was extended and appointed Commander, due to MR and GR wise decision and planning. MR provided political leadership to withstand all pressure from our enemies, inside and outside. GR gave admin leadership and strategy planning. Don’t forget he was an army officer also, before he retired. SF executed MR and GR strategies. He also contributed to strategy planning and provided military leadership. However, SF had imprisoned more than 2000 servicemen on flimsy grounds after bogus Court Martials, for opposing his immorality within the army and his corruption. He was a cruel, vindictive man. MR had them released immediately, when he heared of this. SF was furious. Towards the end of the war, SF’s ego got the better of him. He gave SOLE credit to himself for defeating the LTTE. He downplayed the roles of Navy and Airforce. He devalued the immense heroism of army commanding officers in the front lines and the heroism of the soldiers in the battle-fields. He became immensely envious of MR and GR for their popularity with SL nation for defeating the LTTE. SF contacted JVP, who massaged his ego, and convinced him to contest MR in the Presidential election, and that he had an excellent chance of winning. He visited USA, under pretext of visitng his daughters. He met CIA and other US officials by prior arrangement, who manipulated him to contest MR. All these conspiracies were hatched behind his Commander-in-Chief’s back, while he was still Army Commander. This was betrayal. This was a disciplinary matter as contravening army code of conduct. SF then retired in order to contest Presidential election, as opposition candidate. He had the immense support of JVP, who saw in him their lifeline, to regain power. Other political parties also supported him. USA supported him with financial backing through their embassy, which was a gross manipulation and interference in our election process, for their advantage. He even agreed to TNA demands for ‘eelam’. What treachery, in order to become President, through greed for power! He lost the election through his own stupidity. In his election speeches he voiced his anger against those supporters of MR such as, UPFA leaders, Ministers and celebrities. He threatened them with a blood bath if he won. People realised he was a traitor and a vicious, vidictive man. President MR was re-elected with a huge vote. The people cast their vote intelligently. The people were patriotic and grateful. The ungrateful SF had then conspired with JVP and others to execute Plan B. He had holed himself up in Cinnamon Hotel with a few ex-army officers and army deserters. JVP roped them in from a list given to them by SF of army deserters. Plan B was a coup d’tat. He had in fact conspired Plan B with JVP, well beforehand in case he lost. He treated his whole family to a luxury holiday in China, towards the end of the war, in order to order three shiploads of heavy and light ordnance. He had no authority to do so from MR and GR. He had ordered these for his coup d’tat. MR and GR promptly cancelled this order. SF was furious. He was hopping mad. He lost his marbles totally. He contacted ‘Sunday Leader’ and gave the now infamous ‘White Flag’ story to label MR,GR and a few army officers, as war criminals. This was his revenge and treachery. SF has to blame himself for his predicament when ultimately he ended up in prison, due to his treachery and contravention of army code when he was Commander. He has actually got away lightly for his crime of treachery. Three-year sentence is nothing! In USA, penalty for treachery is death or at least life sentence. SF has still to be tried for conspiracy of coup d’tat. The evidence is ample. He deserves death sentence for this. He does not deserve special treatment in prison. He should never be released. He is an evil, vindictive man who would cause a blood bath with his allies, JVP, if released. CIA and other imperial West agents would support him to topple MR, even kill him and his family, as they got rid of Gaddafi. They want a base in SL. They would carve-out to TNA their ‘eelam’. THE PATRIOTIC NATION SHOULD NEVER ALLOW THIS. TO HELL WITH ALL THE MUD SLINGING AT MR AND HIS FAMILY! HE DESERVES OUR RESPECT, GRATITUDE AND LOYALTY FOR RIDDING THE NATION OF THE EVIL LTTE AND ITS ENTIRE LEADERSHIP. All the right thinking people of this country ,the patriotic elements should heed the clarion call of ND and should support the march towards PEACE and PROSPERITY being carried out by the present regime.ND is not a fanatic supporter of MR ,in fact he was a virulent opponent of MR when Kudu D was given VIP treatment. He,for sure loves his country more.Thanks ND, keep going. Thank you for your kind compliments and support. I know you are a patriotic, clear-thinking and an intelligent person. I believe 65% of the country will continue to support MR and the UPFA. Despite his few mistakes, the country knows he is the best leader we have and UPFA is the best political party we have, to take the country forward from progress to progress, when even the developed countries are struggling today with economic recession and bankruptcy. As you rightly said, I am not a fanatical supporter of MR and GR. I castigated them thoroughly for supporting kudu-D the criminal and murderer. Some people are now slinging mud against Bharatha. They say he was a gangster, a murderer and drug supplier. None of these allegations have been proven in court. But the allegations against kudu-D are true. The evidence have been removed and the eye-witnesses (kudu-D mafia associates) have been abducted and silenced permanently. Eventually, kudu-D will escape again being charged with Bharatha murder. I thoroughly detest and deplore all these crimes. However, we owe it to MR and GR for giving the country timely and the right leadership in totally eradicating VP and the terrorist LTTE, despite tremendous combined political pressure against it by imperial West and their stooges, the local agencies, due to vested interests. This was Phase 1 of Mahinda Chintanaya. Phase 2 is the MC Idiri Dekma, being implemented now on fast-track. We still need MR-GR-BR combined leadership, to combat the relentless political pressure and intimidation of imperial West, their stooges in SL and the TNA and diaspora Tamils/ LTTE. The latter has a plan in stages also called, Track 1 and Track 2 to attain their ‘eelam’ raj through imperial West political pressure, intimidation and manipulations. They may even be conspiring already the assassination of the three brothers through SF, after his release. A new coup d’tat may be in the ofing, if SF the traitor is released. I hope MR is not stupid enough to yield to imperial West pressure and the pressure of misguided people in SL and religious leaders. He must continue to be FOCUSED on MC Idiri Dekma and its implementation for the salvation of the motherland as ONE NATION ONE COUNTRY. If you feel so strongly and so confident that the LTTE will be back stronger than before I suggest you should take your family to a safer place like the middle east or if you are planning to have a family then migrate to a safer place where there won’t be any war or cuirruption. Good luck and when you find such a place let me know I will join you. Nicholas Dias is a retired Lecturer, curently lives in abroad as a Diaspora. AUJ is another Diaspora who came from Tangalle. This man who calls himself ‘AUJMAD’ and Ishan are both most likely living abroad. I suspect they are pro-LTTE Tamil and a Muslim diaspora. Diaspora Tamils are bitter with the total destruction of their terrorist LTTE. They are buzzing around mad like hornets/bees whose nests have been destroyed. They are threatening all manner of revenge on MR and GR and security chiefs. They are using all the money they had collected illegally abroad for lobbying and bribing corrupt leaders of the imperial West, media like Ch4 to publish disinformation drivel and to hire top lawyers to file useless cases in international courts against MR and GR. They are wasting their time. SL will never concede their ‘eelam’ raj. I say to them, “Go and jump into the Palk Strait. Go and fight for your ‘Tamil Nation raj’ in Tamil Nadu with its 70 million Tamils. Don’t try to pull it off in SL. You will fail abysmally, you morons”. Good guess. You are talking about Sri Lanka but hiding in abroad. Why dont you come to Sri Lanka and talk more laudly? This man who calls himself AUJMAD must be having some sort of affection and reverence towards me to borrow my initials and to diferentiate between two of us ,was frank enough to add three more lettrs to denote his own state of lunacy. Such people first need Psychiatric treatment and I can help him by referring him to a very famous Psychiatrist who by talking to the patient himself would bring him back to normalcy without much medication.He is a relation of mine and a close associate. So nothing to worry about the financial aspect. You will automatically drop the last three letters and if you cnnot think of any more names you may use AUJ2 in your future entries. Dear ND, I beg to correct myself. Although the last entry is addressed to you , my last sentence carries an altogether different meaning. I very much regret the error and request my readers to amend the last sentence as “He will automatically drop the last three letters and if he cannot think of anymore names he may use “AUJ 2″IN his future entries. Sorry for the error. mervin silvas gonpart good for him self not all are accept this kind of mervins comedy gonpart in this country there are many sri lankan support for our beloved war hero General sarath fonseka more than mervin silvas GP one day he will see peoples power against him …….